Joyce's oil painting style revolves around a strong sense of color and movement. She enjoys painting landscapes and abstracts. "I have always been a visual person and color is a big part of my world. I see color everywhere," Joyce says. "I have the most fun painting abstracts because my brush and palette knife seem to connect with my thoughts. I never begin an abstracr--they just seem to happen. I often rework a piece which adds layers of texture and color." Her landscapes are from photographs, although she has ventured into plein air painting. "I discovered painting outdoors directly increases my ability to get oil paint on myself and the car," Joyce quips. As a former teacher, she painted weekly with a group of friends, growing and experimenting with her art. Since retiring and relocating to New Bern in 2015, Joyce paints at her home studio and is active with Twin Rivers Artists Association. Leslie describes herself as an oil painter of living things, with the challenge of the human form included from time to time. Leslie's art has evolved considerably over the last few years, from very controlled to a flowing loose stroke. She starts with an under painting of mostly transparent paints, allowing it to drip down the canvas to get an always unexpected texture before pursuing the main composition, thus allowing the background to impose on the main subject. This technique has evolved rather quickly for her and gives an individual quality to her work which she is very excited about. She loves painting barnyard and wildlife, and especially horses and hounds--the form, expression, and action engages her. She uses photographs in interesting compositions on the canvas, intending that they are not static, but a part of the wholeness of themselves and nature. Her attention has been drawn over time to landscapes and flowers (ever so abstract), both of which she finds challenging subjects. She moved to New Bern July 2017 and immediately pursued the opportunity to become involved with her creative peers. She was featured artist in the Oriental Artists Gallery, Neuse River Artists Tour 2017. She also has shown in Bank of the Arts, and won a 3rd place award in Morehead Carolina Artists Gallery 2018, with shows in Washington, Great Falls, Leesburg and Middleburg, Va., and Oriental, Morehead City, and New Bern, North Carolina. Leslie attended University of Maryland as an art major. Speaking of her work, Nada Behr says “art is discovery…, color is happiness.” This philosophy is evident in her body of work, which makes marvelous use of bright, intense colors combined in a manner that reveals a detailed understanding of color theory. Her work makes use of both wet and dry techniques, showing technical finesse in her chosen media. Nada works vary in scale from miniature to medium scale, with themes of landscapes, flora, and rural scenes. Nada received her B.A. in Arts Education from Adelphi University. Her work has garnered recognition from the Eastern Watercolor Society of North Carolina, Twin Rivers Artist’s Association, Greenville Museum of Art, and signature membership in the Watercolor Society of North Carolina. Her work is included in numerous private business and collections throughout Eastern North Carolina and beyond. Sandy moved to New Bern in 2001 after having lived in Berlin, Germany for three years. While there, she had the opportunity to travel throughout Europe and visit many galleries and museums. In Berlin, she studied oil painting at the Technical University and led art tours throughout the city. Sandy as a BA in Art History with a dual minor in English and Studio Art from St. Joseph College in West Hartford, Connecticut. Her artwork has been showcased at the former Baxter's Fine Art, Bear Hand Art Factory, and the Bank of the Arts. Sandy has taught art to children and adults in Connecticut and New Bern. She served on the Board of Directors of the Craven Arts Council & Gallery, is a member of the Twin Rivers Artists' Association and the North Carolina Watercolor Society, and is currently serving on the Board of Directors of Community Artist Will. She has studied under Miles Batt, Tony Couch, Skip Lawrence, Jeff Jakub, and Dan Nelson. By profession, Sue Callahan is a nurse/office manager, working in a doctor’s office setting for most of her career. She moved to New Bern in 1981 with her husband, Ray, and their two children. By vocation, Sue is an artist. Sue was always interested in anything crafty or artistic, and in 1993, she attended Stained Glass classes through Craven Community College. She operated a custom stained glass business from 1997 until 2014. Sue designed and created the windows in First Presbyterian Church Ministry Center Chapel, in Unity Christian Church Sanctuary, and in various homes in and around the New Bern area. She has had stained glass pieces displayed all around the world including Germany, Spain, Australia, Africa, and Russia. Around 2013, Sue’s interests turned to acrylic painting. Along with High School art classes, she has studied through online classes with Will Kemp Art School, ArtTutor.com and many drawing and painting books. Her work has yet to settle on a specific style and she loves to experiment with different subjects and mediums. Recently, Sue has been pouring acrylics, with an emphasis on poured backgrounds with more detailed acrylic paintings on top. Sue joined Community Artists Gallery (CAGS) in January of 2019 and enjoys being a part of this amazing group of talented artists. Visit her at suecallahanart.blogspot.com and on FaceBook at Painted Visions, art by Sue Callahan. Susan is a founding member of Art on the Neuse, a yearly art festival in Oriental, NC, and the Coastal Carolina Plein Air Painters, which brints over 70 registered artists together for once-a-week outdoor painting. For a decade, Susan has studied with Susan Sarback, a Sacramento California artist, who has her own School of Color and Light, involving a technique called "full color seeing.” Susan uses this process to create paintings using "color notes," the visual equivalent of musical notes. "The world never looks the same again after your eyes begin to be sensitized to full color seeing," Susan says. "You see the world like a child, fresh and new." Her passion is color and light connected with the creative life force energy within us all.She has a degree in Environmental Design from NCSU. Susan also teaches therapeutic yoga and is a Reiki Master. A North Carolina native, Janet earned a degree in landscape design and horticulture from North Carolina State University. She moved to New Bern 12 years ago, and upon retiring from her job in 2016, she began painting in pastels. Her favorite subjects to paint are landscapes, flowers, and Ocracoke beaches. She is a member of the Coastal Carolina Plein Air Painters and enjoys photography, walking on the beach, and discovering the eastern parts of the state. Ann Marie Hodrick began with sewing, crafting, and coloring while in grade school then moved on to painting, drawing, and metalsmithing in high school. While in college, she continued with those mediums and explored ceramics, printmaking, and fiber art at Loyola University, New Orleans. She founded her line, Heart’s Desire Jewelry, in 2004. Using responsibly-sourced, high-quality natural stones and organic elements, Ann Marie creates necklaces, earrings, and bracelets that not only look good, but also help the wearer feel good, too. Ann Marie’s jewelry collection is all one-of-a-kind or limited-edition pieces. Ann Marie personally selects the most unique gemstones, lustrous pearls, and exotic elements like ancient fossils and artifacts of the highest quality to use in her stunning designs. “I want the person who wears my jewelry to benefit from the love, strength, desire and power that I feel as I create,” Ann Marie says. “Above and beyond the physical elements that go into each design, it is these spiritual elements that set my work apart from mass produced jewelry." Ann Marie’s appreciation of our world and its peoples has led her to make a priority of using supplies from socially responsible vendors. Many of her gems are cut by a family- run business in Jaipur. She especially likes to work with suppliers who make it a point to present the gems as they are when they are unearthed, without enhancements of any kind. Ann Marie uses .925 sterling silver, .999 fine silver, gold-fill, vermeil and solid gold and is aware that the mining of most new precious metals negatively impacts the environment and the cultures surrounding the mines. Because of that, she now buys her silver and gold wire and sheet metal from vendors who sell refined (recycled) metals and she collects her scraps to be refined so that she can help to minimize her effect on the environment and promote a healthier world. Ann Marie cherishes old jewelry parts as much as she adores keeping an eye on what’s current in fashion. Those inspirations mix together in a style that expresses itself in many lights…from vintage to modern…organic to graphic. No matter which muse is speaking to her, the result is always stylish, wearable art. Simone Houle has been involved with arts and crafts all her life. After she and her husband moved to New Bern in 2006, classes in basketry, art, drawing, and stained glass at Craven and Pamlico Community Colleges took her creativity in new directions. An advanced course at Mystical Reflections Glass and Art Studio in Calabash, NC, taught her even more sophisticated techniques. She now designs her own baskets, and continues to learn, innovate, instruct, and exhibit. Wendy is an award-winning lampworker. Wendy studied art throughout high school and college, and originally planned to be an art teacher. Although she found her career in computer science, she started getting into glass in 2012 and now has a passion to be at her torch. She enjoys adding metal elements along with glass to her designs to create unique jewelry and other functional pieces. Recently retired, Wendy now spends her days happily at her torch and volunteering at the Gallery. She has attended workshops with Corina Tettinger, Kristina Logan, Leah Fairbanks, Heather Trimlett and Patti Walston. Wendy recently studied with Davide Penso on a trip to Murano, Italy. Betty has a BA in Fine Arts and an MA in Art Therapy from Montclair State University in New Jersey. She was a practicing Registered Art Therapist (ATR) for over 30 years and served as Director of Therapeutic Services at a large psychiatric hospital in New Jersey where she began her career working with adolescents, helping her patients express and understand themselves through art. She has also taught Art at the college level as a visiting adjunct professor. Today, she is retired and focusing on painting. While continuing to explore different mediums, her work centers on botanicals—particularly in watercolor. She loves to paint outside, en plein air, or from photographs she has taken in her yard or her travels. She moved to New Bern in 2006 and currently serves on the board of the Twin Rivers Artists Association. Heide Ann Lock has recently moved to New Bern from Connecticut where she was a member of the Society for Creative Arts of Newtown (SCAN). While a member of SCAN Heide parcipated in member shows and was accepted into many juried shows. She has been working in Acrylic and Oil paints and enjoys both mediums. Her work has been shown in Connectiticut venues and is in private collections. In looking for a place to retire, New Bern topped the list due to its charming downtown, friendly neighbors and vibrant arts community. She is thrilled to be a part of Community Artists Gallery & Studios and looks forward to the camaraderie of painting with this fun group of artists. Marvin is an architect and artist from New Bern, North Carolina. Born in central Missouri during WWII, Marvin has had a lifelong interest in expanding his world experience. That quest has taken him throughout Scandinavia (where he lived and worked in Copenhagen Denmark), Great Britain, Europe, Canada, and the United States. Marvin also worked in New York City, and Little Rock Arkansas before settling in New Bern, NC, in 1988. After fifty years in the architectural profession, Maune has turned his focus toward creating artwork. It was during his time in Denmark that Marvin developed a passionate interest in sailing, and the coastal environment, which influenced his decision to settle in New Bern. His work is focused on capturing the emotion, light, and feeling of a particular moment in time, a special place, or special experience. Although not always technically figurative, much of his work includes images of people, which gives his paintings a sense of scale and action, drawing the viewer into the message of the painting. Other examples of his work concentrate on the graphic composition found in still life subjects or details of building elements. The diversity of Maune’s subject matter reflects his interest in all aspects of human endeavor, and the man-made world we have created. Working in acrylics, oils, and watercolor, his goal is to develop images reflective of these diverse interests. His work has been exhibited locally at the Bank of the Arts and Carolina Creations, in national juried shows, and is found in many private collections. A native of North Carolina, Eleanor earned a BFA in the visual arts from the University of North Carolina Chapel Hill. Her early work was more abstract and conceptual. As an undergraduate, she exhibited her work at the Ackland Museum and the Mint Museum in Charlotte. She feels privileged to have studied with Susan Sarback, Peggi Kroll Roberts, John Ebersberger, Mary Gilkerson, and other inspiring artists. She describes her work as "most influenced by the Hawthorne-Hensche principle," an approach of seeing and painting color and light in an impressionistic way. "Now I am a 'Coastal Carolina Colorist,'" Eleanor says, "inspired by what nature provides and loving the practice of continuing to study and progress as a painter in the oil and pastel mediums." She is an associate member of the American Impressionist Society, and belongs to the Arts Council of Carteret County, Coastal Carolina Plein Air Painters, and North Carolina Plein Air Painters. 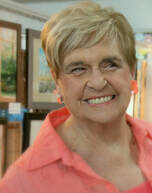 She also has served on the board of Carolina Artists Gallery in Morehead City, NC, for years. Diane has drawn and painted her entire life, winning awards in high school and college. Watercolors were her first love, and that medium remains her specialty After majoring in graphic design at the School of Visual Arts in New York, she pursued a career as art director for a promotion advertising agency, with clients from AT&T to Burger King. She has won awards in many art shows over the years, and values her membership in local artists' associations. Currently, Diane is secretary of Twin Rivers Artists Association in New Bern. Mary was born in New Bern, but moved to Virginia as a young child. For most of her career, she was the system analyst responsible for all commercial payments for both the U.S. Coast Guard and the Transportation Security Agency. After retiring from government, she returned to her hometown. She began her artistic career as a decorative painter, then quickly moved to oil and watercolor painting through workshops and local classes. She was introduced to the Community Artists Gallery & Studios during her first ArtWalk, and says that its welcoming atmosphere gave her “the confidence to display her art in a gallery for the first time” as she continues to develop her skills. Becky has worked in photography off and on for over 50 years, starting during her college years with black-and-white film in a chemical darkroom. After a 25-year hiatus, she decided to return to photography and explore color in the digital milieu. She shoots with Nikon equipment and post-processes with Photoshop. She has studied with Bill Barksdale and Eric T. Kunsman, also keeping her techniques honed with various online classes. Her work has been exhibited in Pennsylvania, New Jersey, and North Carolina. She has been a member of Community Artists Gallery & Studios since 2014. Her mission is "to light a spark, whether it is beauty, curiosity, or a sense of wonder." Karen has been studying art for most of her life. She went to the Art Institute of Chicago when she was 13 and took classes for the summer. That experience sent her off on a long journey learning all forms of art. She began plein air painting about five years ago with the Coastal Carolina Plein Air Painters and loves the adventure of painting outdoors. Karen has studied with many North Carolina artists including Ed Macomber, Richard Christian Nelson, Dan Nelson and John Ebersberger from Maryland. She was awarded first prize in 2015 at the Twin Rivers Art Association (TRAA) annual show in New Bern. She belongs to the Coastal Carolina Plein Air Painters, the TRAA, and the Craven Arts Council Bank of the Arts. After moving with her husband from the Washington, D.C., area to New Bern, the charms of coastal Eastern North Carolina reinvigorated Belinda's "passion to express God's beauty in painting." Her mediums of choice are mostly acrylics and watercolor. Belinda studied geology and geography at George Mason University and the University of New Mexico), and she retired as a civil servant and cartographer from the US Army. She has taken a variety of art classes over the years. 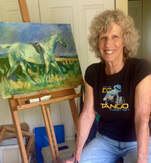 Currently, she is a member of the Coastal Carolina Plein Air Group and also belongs to theTwin Rivers Art Association. She is a member of the online gallery Daily Paintworks where most of her art work can be seen. Belinda ‘s most recent accomplishment is winning the 2016 New Bern Mumfest competition, which made her painting the official artwork for the New Bern Mumfest 2017. Patty moved to North Carolina, from Ohio, in 1986 when the manufacturing company where she worked moved their headquarters. Patty has a B.S. in Business and retired as Vice President, Controller. She has served on the Boards for National Association of Accountants and Interact (an organization working to end domestic & sexual violence). As an accountant “creativity” was discouraged. To escape from the black and white world of accounting Patty sought a release for her creativity. She started working with silverplate. The drive behind this was to take something that was discarded, or no longer useable in its original form, and make it into something that is useful and beautiful. Virginia grew up on Long Island and attended private schools. Her love of art comes from many years of all different kinds of creative projects and a love of traveling. She worked for Eastern Airlines before starting a family. During the years of bringing up children and working, she kept busy with quilting, macrame, knitting, and decor-ating. She retired to New Bern in 2000 and started painting; soon, one of her paintings was chosen to be featured on a postcard promoting New Bern's Art Walk! She is on the board of the Twin Rivers Artist Association and is a member of Craven Arts Council. "My love of color is one of the reasons I create with oils, acrylics and watercolor," she says. She loves to find inspiration for her art through travel. Growing up in New Jersey, Debra always loved to draw and paint, considering herself to be one of the lucky ones who always knew what she wanted to be "when I grow up." After completing her BFA at Syracuse University, she ventured into the graphic art/ advertising field, a route chosen to provide for "paying the rent and avoiding the starving artist syndrome," she says. "I came to actually really enjoy this business; I learned a lot and it allowed me a creative outlet." After a number of years working in both Maryland and Florida, Debra eventually started her own business, freelancing from home. After raising two kids in Arizona, she retired to New Bern in 2016, drawn to the small town charm and the surrounding woods and water. "I now have the luxury of spending time working in my little studio at home, my favorite medium being pastel, but I also like to switch things up with oil, watercolor, acrylic, charcoal... whatever captures my mood at the moment," Debra says. She is drawn to "a lot of color and contrast," and for subjects she favors nature and portraiture--both human and animal! Debra is available for portraiture consignments of both people and pets. Born and raised in Carteret County, Amber has pursued a career primarily in management and sales. She is now a full-time artist and owner of Wine & Design in New Bern. Drawn to all things creative, Amber has experience in building, refinishing furniture, stained glass art, and painting. She "loves finding new life and purpose for ordinary things." Eileen, the current president of Community Artists Gallery & Studios, brought her love of painting from New England to New Bern. After a 20-year career as a corporate meeting planner, retired to Martha's Vineyard, Massachusetts, with her husband. She became a licensed Realtor and also decided to try her hand at painting, beginning with watercolors, taking as many classes possible. Ten years later, they moved to New Hampshire and Wroe was inspired to take up oils, studying with Lois Griffel and Susan Sarback, well-known followers of the artistic principles developed by Charles Hawthorne, an influential American impressionist who founded The Cape Cod School of Art. After moving to North Carolina, Eileen became a member of the Coastal Carolina Plein Air Painters (CCPAP) with whom she paints regularly. She also joined Twin Rivers Artists Association (TRAA), and in 2015 was Program Chairman and Vice President.